Can’t escape the feeling like you need to do something … anything with your hair? Struck by an overwhelming urge to cut a fringe again? Are you aware of a super cool bangs trend that some say changes everything? No, really, they’re a thing. I’m not making that up. You may know them as Bardot bangs – so yeah they’ve been around awhile. It’s just that they’re trending again. Think maybe it’s time for you to become obsessed with them like everyone else? What’s the Best Way to Style Them? For those of you who don’t know a curtain fringe is a kind of chunky yet wispy at the same time. Such a fringe is rocked with a center part and kinda flares outward on each side of your face. Which is why some may know these as “wings”? They’re snipped shortest in the center and then angled to gradually get longer towards the ends which should flirt with the corners of your eyes. The result is the cutest face framing bangs with a separation carved out in the middle. Usually centered, a slightly off center part is perfectly fine too. Don’t let the fact some are snarky enough to call them “gateway bangs” or “bangs with training wheels” suitable only until you can get the real deal. Pay them no mind. With curtain bangs you don’t have to get a full chop to enjoy a “real deal” fringe. All in all it’s a great way to freshen up your look without sacrificing a ton of length. Obviously any of the following should be evaluated on a person to person basis as everyone’s situation is unique. But generally these points apply. Face shape: Most feel they are flattering to most any face shapes. Depending, they can be cut longer or shorter to best set off your features. Forehead: Girls with longer and wider foreheads are perfect candidates. Because this type of bang perfectly creates the illusion of a shorter, more petite forehead. Still what’s good news for some is bad news for others. If you already have a smaller forehead this may not be your best look. Because you may benefit most from a cut or style that expands your face a bit. This type of bang generally will not do that. Cowlicks: These should be taken into consideration whenever bangs on the agenda. Hair type: Typically they work best for those with straight hair or strands with only a hint of waviness. As with most things bang coarse and curly will be most challenging. Hair Length: All lengths qualify. 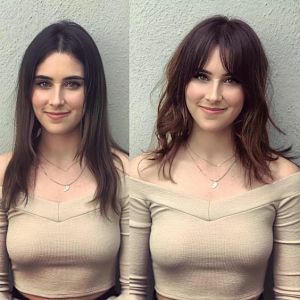 Best candidates would be lobs – which bangs don’t look good with a long bob? or longer cuts in general. Good question. You seem to know all bangs require special handling. Obviously you’ll want to develop a styling routine. Luckily there’s a couple of videos below that can point you in the right direction – with or without a mini flat iron. A smaller round brush is needed so you can tug on them to keep up the tension while hitting them with a blast from your hair dryer. You can often get by with a quick sink washing most mornings when you aren’t going to lather up. Some find a light spritz with warm water and a minute or two spent styling with a dryer is all it takes to revive them. Others report good luck with dry shampoo. Both for styling and given you may find yourself swatting them to the side out of your eyes from time to time to keep any grease under control. So dry shampoo will help them hold their shape without looking too greasy by the end of the day. Other than that, by their nature they are more forgiving. Which is to say you won’t be making constant trips to the salon for a 10 minute trim to keep them perfectly ship shape. So when it comes to maintenance, what maintenance? Being more of a laid back, lived in look, the appeal of this bang is the need for little to no styling. Turns out they are almost as effortless as they look to be. Who knew? Yet the trick is to get it to sit right while spanning your forehead. Fine hair may need help with hold – think light weight mousse. Thicker hair may need more product help. Plus your blow dryer can lend a hand too. But all is not unicorns and rainbows. Some discover that their’s NEVER sit exactly how they want them to. Yeah, if all that has caused you to give into the siren call of curtain bangs then you need this how-to-style-them video. It’s perfect because it eliminates the need to figure it out on your own. So don’t be shocked if you end up being super happy with how your fringe looks when styled this way. The trick is to get them to sit right. She explains it quite nicely actually. You’re shooting to get an imperfect relaxed bend. You’ll also see her approach to blow drying. Beware of this trap on your way to cute, swooshy curtains. You can ask for them but that’s doesn’t mean you’re going to get them. Even tearing out a photo from a magazine doesn’t guarantee you won’t end up with a rather blunt bang. Sure having images for show and tell can go a long way to ensuring you get what you what you ask for. Way better than just trying to explain it verbally. Yet it may not hurt to double check and let slip that blunt bangs are NOT what you’re looking for. Regardless this still isn’t a DIY bang. At least not the first time. You want it to blend with your cut, enhance your face shape and work with your natural hair texture. That may be more than a new bangs cutter can hope to achieve. The angle from short to long can be tricky to get right too. But it’s easier if the point of separation is properly selected to begin with. All this takes someone with experience. After the first time though you’ve got a road map to follow making round two a safer DIY option. So for those brave enough to take things into their own hands here’s the video for you. Do You Dare? How to Cut Curtain Bangs Yourself! As you’ll see it’s gives you a precise, easy to follow, step by step approach you can follow. She even shares a pretty much genius trick to insure both sides are the same length. Just remember, it’s always possible to cut more, but impossible to put back hair you’ve already cut off. Bonus. She shows how she styles them with a flat iron. Should that be your tool of preference you won’t want to miss that. This is almost the best part. Usually these bangs grow out without any of that awkward period nonsense. You know, that phase where you’re feeling like everyone is looking at you and that side show taking place on your forehead. You could almost say they’re in grow out mode from the jump as they are cut to blend with the rest of your hair from day one. So unlike other bangs there really isn’t a hard and fast or obvious grow out phase. That’s because they aren’t a straight across style that you have wait out and cope with. So no struggle. Hey! Why not follow our Popular Pins board on Pinterest for even more useful ideas like this that can boost your hair styling IQ and help you to turn heads?